Aside from canvas, one of an artist’s most important tools is his/her paintbrush. Your paintbrushes are your investment and you have to take good care of them so you can use them for a long time and you get your money’s worth. It’s a waste of money if you just leave your brushes after painting and they end up worn and unusable next time you paint. If you clean your brushes and store them properly, you can lengthen the lifespan of your brushes. After painting, it’s wise to clean your brushes and store them well. Here are steps on how you can clean your paint brushes. 1. Prepare the things you need. Get your paint thinner, turpentine, or mineral spirits, a small container, and some old newspapers or tissue. 2. 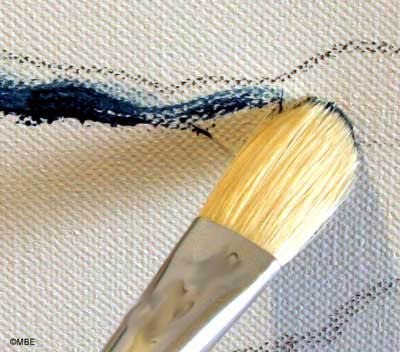 Wipe off excess paint from your brush using the newspaper or tissue. Gently squeeze the bristles from the ferrule (metal part of the brush) to the tips. Keep squeezing the brush but not too hard as to pull on the bristles. 3. In a small container, put some thinner, enough to dip in your brush. Rinse the brush to loosen more paint. You can use lukewarm water if you used a water-based medium in your painting. Important: Don’t use hot water since it can expand the ferrule which causes the bristles to fall out. 4. Wipe off excess paint with more newspaper. Squeeze off the thinner from the brush. 5. Wash the brush using a mild soap (liquid soap can also be used). Put soap on the brush and gently create a lather in a container or your palm. Let the soap penetrate the bristles to loosen more paint. Use disposable gloves if you’re concerned about possible absorption of Cadmium into your skin. 6. Rinse and repeat until there’s no trace of coloring coming out of the brush. 7. Shake off excess water and use the newspaper to get most of the water out of the brush. 8. Gently re-shape your brush head to its correct shape using your fingers. 9. Leave the brush to dry at room temperature and store it bristles-up in a jar. Clean your brushes immediately after painting. Don’t leave your brushes soaking in thinner since it will weaken the glue holding the bristles together. Be patient when cleaning your brushes. Rinse it several times to get off the paint. 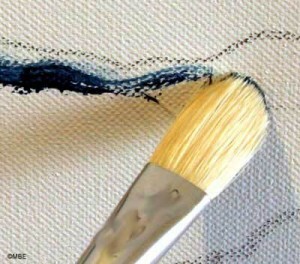 Use separate brushes for oil painting and water-based mediums. Why Buy Canvas Art Supplies in Bulk?